The first castle on this site dates back to the 12th century and was much smaller than the one we see today. Owned by the Malaspina family, they sold it in 1141. 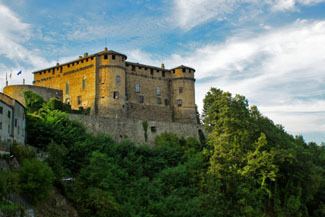 A new castle was built in the 13th and 14th centuries by the Landi family from Piacenza, and they ruled the Valtaro valley from the castle for some 425 years, but like many great families of the time, they eventually died out with no heirs to keep the line going. The last descendent, Maria Polissena Landi, married Gian Andrea II Doria of Genoa, giving the castle and all the Landi properties to his family as a dowry. The Dorias, who had no interest in the castle, sold it to the Farnese family, who slowly allowed the castle to deteriorate. By the 19th century, Maria Luisa, duchess of Parma, used the castle as a prison. In 1900 a local priest bought the property, and it eventually became a boarding school. In 1966 Marquise Lina Raimondi Gambarotta bought the castle and furnished it with treasures from her many travels. Upon her death, she bequeathed the castle to the community of Compiano, with the instructions that the rooms remain unchanged. If passing through the area and you can't overnight, with advanced notice you can stop by to visit the castle and museums and combine it with lunch or dinner. Parking is nearby, so be aware if you have heavy pieces of luggage to reckon with. Compiano is between Parma and La Spezia. From the A15 highway, take the Borgotaro exit and continue on SP4 for 14 km (about 20 minutes). The nearest train station is at Borgotaro. Yes, both civil and religious. Consacrated chapel on site. As you wind up in the hills above the Val di Taro, between passes that link the regions of Emilia, Tuscany, and Liguria, it’s easy to see why a huge fortress exists here. And when you reach the top, you’re rewarded with 360º views of the beautiful Italian landscape. All is quiet and peaceful, and even the tiny village of Compiano below seems to slumber in another century. Half of the castle is given over to its museum side, while the other half hosts guests, corporate meetings, and weddings. Hospitality here is warm and caring. Guest rooms vary between the petite and the large, and all are quite cozy. Furnished in a simple yet classic style, many are accented by a singular antique. One room still retains its original 17th-century ceiling. Rooms bear names such as Farnese, Fieschi, and Bourbon. A small antique door opens up onto the Grimaldi room. A home-made breakfast is served buffet style, while the Al Panigaccio restaurant features well-prepared local specialties. Wi-Fi is free and in public areas. Three museums: the Raimondi Gambarotta Marchioness Museum, the Masonic Museum (unique in Italy); Food and Wine Museum (available by guided tour).